Hilton Bonn hotel in central Bonn, overlooking the River Rhine and 5 minutes' walk from Bonn attractions offers 252 rooms. The hotel also offers several meeting event spaces of which the largest meeting room is of 3615 Sq. Ft. The restaurant seats 60 to 80 people and also offers in cooler seasons a beautiful view of the Seven Mountains and Bad Godesberg. Restaurant is ideal for larger companies, such as weddings, family and corporate events and can be booked exclusively. Welcome to Hotel Garni Am Roemerhof. Most hotel rooms are situated either the courtyard or quiet side street. All rooms are equipped with cable TV, telephone and shower or bath and toilet. Choose from over fifty loose teas and sweeten your mornings. The centrally located Gasthaus Drachenburg offers nine comfortably furnished rooms. Our rooms overlook the eponymous dragon castle in the Seven Mountains. We look forward to your visit and will do everything to make you feel right at home! Welcome to Hotel Kronprinzen. We are a Grade II listed Art Nouveau villa in exclusive residential area of ​​Bonn Bad Godesberg. All guest rooms are individually and comfortably furnished. Wi-Fi is available throughout the hotel & in the guest rooms. The AKZENT Hotel Am Hohenzollernplatz is the perfect place for Business travelers, cultural travelers, and conference participants. The hotel has technically equipped meeting space and comfortably furnished sleep rooms at your disposal. Hotel Baden is located at Graurheindorfer Strasse 1 in Bonn. The hotel has well appointed guest rooms. All the rooms are equipped with modern amenities and features to make your stay more comfortable and pleasant. Hotel Aigner lies within the Old part (Altstadt) of Bonn which is very low on traffic. The hotel offers comfortable sleep rooms. The hotel also has a little conference room if you need it. 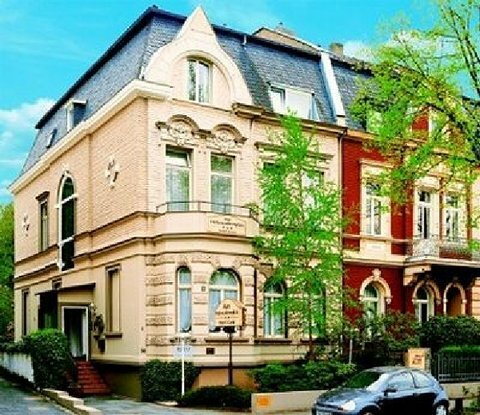 Hotel garni Jacobs enjoys a quiet location in the Kessenich district, right at the foot of the Venusberg. Our individually furnished single and double rooms cluttered with their rustic and antique furniture are there for the guests. Apparthotel Bad Godesberg have created for our guests an oasis, a charming home away from home, in the countryside, high above the roofs of Bad Godesberg city. It has a meeting room for 12 people. Situated in the heart of Bad Godesberg, the INSEL HOTEL offers 3 conference areas location for family celebrations and celebrations of jubilees. With tasteful and modern interiors, our 65 comfortable rooms offer stylish accommodation. Hotel Kurfuerstenhof is located in Bonn. All rooms are furnished by modern and stylish furnishings. There are rooms equipped with all basic amenities. Hotel zum Loewen has a central location in the heart of Bad Godesberg and offers 40 comfortable and fully furnished guest rooms with all the basic amenities. V-Hotel is located at Haager Weg 44 in Bonn. It is a comfortable place to stay and relax. It is surrounded by greenery and provides peace. Located in Bonn is the best in class place to stay. Located near the heart of Bonn, BEST WESTERN PREMIER Hotel Domicil offers 44 fully furnished rooms that are decorated recently to provide utmost comfort to the visitors and guests. We also offer a meeting room for events and functions.